Corporate enterprises, small medium businesses, individual professionals, students and teachers. 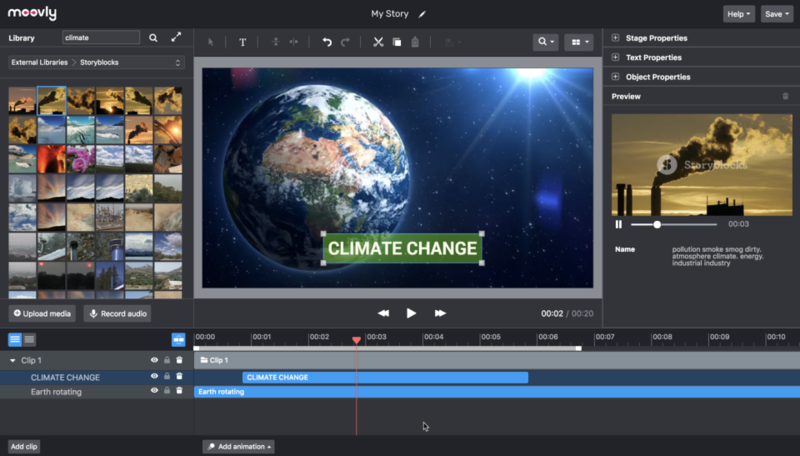 Moovly is an online application to easily create videos using libraries of stock media in combination with your own media objects. Using a combination of uploaded images, videos and sounds, as well as a library of millions of objects (images, sounds and videos) in different styles, you can create videos, download or publish them on YouTube, Facebook or Moovly's Gallery. Moovly has a powerful free trial version, pro subscriptions and customizable enterprise solutions. 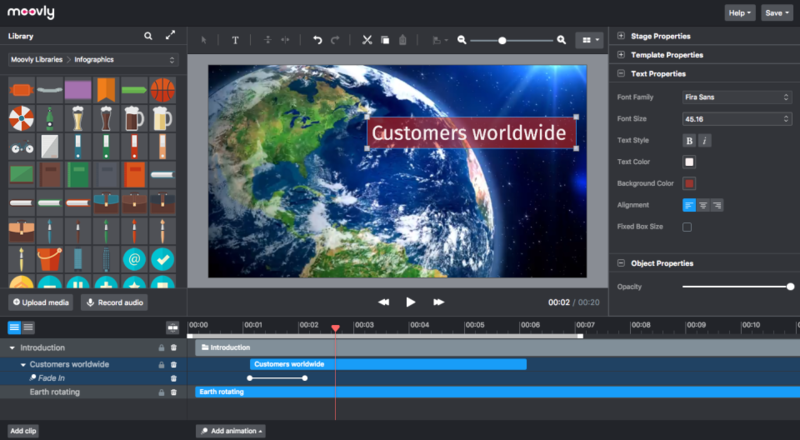 Advance video editing in browser, from anywhere. Pros: I like the UI which reminds me of some of pro video editing software. I really need some time to learn. It is not plugged and play, as being an advanced browser-based editor. But if you have some previous experience with video editing you will be very pleased. No more high graphics rendering for videos just create it from here, your next viral video is waiting to release. This advance transitions, sound and images really make it versatile, which fits for all type of scenario. Presentation, short intro you can use everything under one app. Cons: When inserting a template it really takes lots of CPU resource, which crashes my chrome every time I start. I needed to open it in firefox still it is taking a lot of resources. Overall: A grate semi-pro tool to create the presentation, online intro and some little screen recording and voiceover for the tutorial. It still has some bugs, like crashing, not uploading video/image file, but overall it is a great tool, to begin with. A very frustrating experience with Moovly. I do not recommend this at all! Pros: The idea is of creating an animated online video is good. When the software works, it's easy to use. Cons: There's far too many problems with the software. For starters, the rendering takes an extremely long time, and sometimes it would never even render for you to download. When i reached out to the customer support, it took over a week to get a response. This is the most frustrating part. Secondly, the software has glitches - if you move items in the "stage" , an error would appear and you have to click refresh every time it happens. In your own personal library, when you want to delete a clipart, it doesn't happen, therefore your library just keeps building and building and you can't clean it up. Their tech support said they're unable to fix this....Thirdly, it does not allow you to efficiently upload your own videos and audio. It either takes an extremely long time, or would never upload. Moovly uses their own server and this is the part that's frustrated and slow. Also, their images for animation is limited. 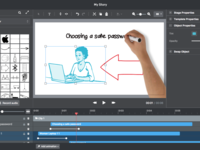 It's more like a "video" creator where you take stock videos and photos to create your video. Animating has its limitations for sure on this. Moovly is a video creator that's in its beta testing stage. There's far too many glitches and problems that their tech team is unable to correct efficiently. It's a very pricey software that does not work well. Equally as frustrating is the support team, who do not respond consistently. It took up to 7 days for some replies and sometimes I got no response at all. Very frustrating experience. I DO NOT recommend! Overall: I learned about buyer beware. My Moovly would not open after I tried reviewing my work, I contacted customer service and nothing. Pros: I did like the short videos, however I was not able to use the video at all because I wasn't able to get back into my project. Cons: The backbone of the software needs to be worked on, there are several glitches whenever editing the video, and for me, I wasn't able to get back into the video I previously made after coming back to it. Customer service got back to me once a day, and asked me the simplest questions for about 3 days. By then I have already lost 3 days and my project is about to be presented, so I have an alternative that won't fail. Very frustrated that I spent a work day on a video that I can't even get back into, even with customer support. Overall: I was not able to get any benefits except a wasted work day, my project would not open again. The issues reported by this user were, based on our first observations, related to personal computer and internet connection problems. While we did not get an answer from the user on the technical questions we asked, we regret the problems the user experienced and are still open to help resolve the issues. There are every day thousands of users using Moovly for their video projects - and happy about it! 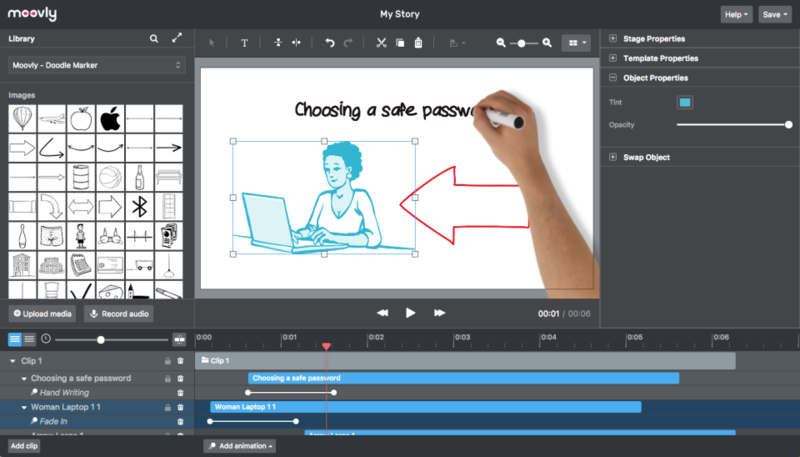 Pros: This is an inexpensive and easy way for someone to start making great looking video / animated presentations. One of the features I really appreciate is the ability to use real video as a background. Some of the other presentation software I've used does not have that ability. 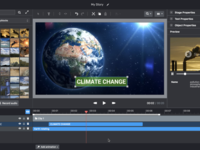 They also lay out the different layers in a timeline similar to what you might find in many other video editing software... so the layout seems familiar if you have some video editing experience. I also appreciate the ability to set the timing for the transitions instead of only getting a defaulted time. Cons: It is clear that the software is constantly improving. I've seen some glitches with their new site release that may be more browser related. Their transitions are somewhat limited. Overall: The ease and simplicity of this software helps us cut down on the production time. 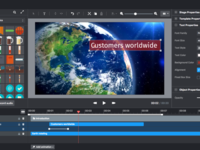 Pros: It is an easy platform to create custom marketing videos for your business, and one of the features that always stood out to me was the ability to have video backgrounds. Cons: I fee like it is easy to get lost in the multiple layers on the time line. There may be a better way for this to be consolidated, but it is something that can be figured out by diving in and playing with it. Also, there was a time when I needed some assistance with customer service and no one responded to my inquiries. Overall: This was the first program I found that allowed me to use video backgrounds in our marketing videos. Pros: Moovly allowed me to create simple and fun videos with little to no expertise in animation. The best part is that there are helpful guides in-app to make sure you are using the different features correctly. It also runs very smooth despite processing very large video files. Cons: The transitions and effects are great, but few. I would like to see more ability to customize the animation of the movement of objects on the tool. After a while, our videos have begun to look the same. Overall: Easy to get started, Easy to create videos, and the price is relatively low and great when compared to other products on the market. Pros: I used the free trail to make quick white board explanation videos, I was able to make a quick video including the features like hand animation, fading in and out as well. This software also have a library feature, thank you! Cons: I hope they make it more user friendly, and colorful as well, they can make adding of animations option a lot less complicated then it is. Pros: I initially like the ability to use tools to create the video commercial I wanted but then found the tools to constantly crash. On Mozilla and Chrome. Cons: All saved projects vanished and customer service did not help. They just canceled my account without trying to find a resolution. They would not refund my fee when, from day 1, I had trouble with extremely slow load times (using infra-red internet). I'm still waiting for support after a week to figure out what happenned to my files. Overall: I am not happy and feel like I've been taken. Customer service has been horrendous and dissappointing. I do not need the stress that this program created for me. Pros: More than anything, I like the results that I get. This program allows me to quickly create videos with direct messages without being very professional or complicated because it is so simple. You don't need any expertise or experience with video editing programs. The tutorials are so useful so anyone should have any problem. Cons: I think there are few computer graphics, nevertheless, they are very good and useful. Also, few pictures so you have to look for them on the Internet or pay for them. Overall: We use Moovly to make our infographics for the social networks or similar. Pros: that's easy to use and that there is free vectors to use. Cons: i think the video editor interface can be made easier to use. 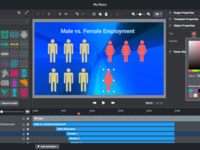 Pros: Easy to use, easy to create sophisticate animations and movies at a low cost that can be used as stand-alone items or integrated into online platforms. Cons: Higher learning curve with not a ton of user support. Little documentation that you can use when you get stuck. 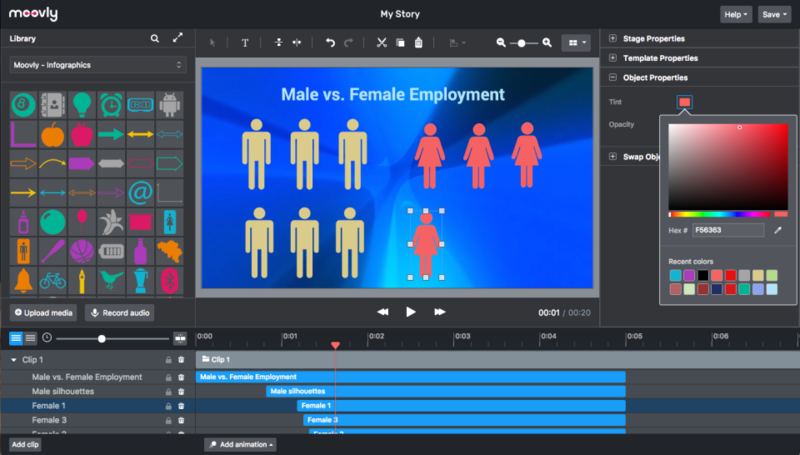 Overall: Easy to quickly create sophisticated movies and animations. Pros: The thing I liked most about Moovly is that it is very user-friendly for non-experts. The "getting started" video was very helpful and I definitely recommend users to read the articles of the Moovly team. Cons: As a student, I wasn't sure about the pricing. Luckily, Moovly also provides an Education plan. "How can I engage my audience better?" Pros: Easy to use and powerful. I have created many videos in a short time. They also allow 1080p video rendering with the subscription. Cons: Customer Service needs improvement. I asked a question and the answer was not satisfactory so I had to go looking for an answer on Google. Not good if you have a chat available for support. Overall: Easy video campaigns for Facebook and Youtube. Pros: The ease of use. Would be interested in discussing other packages but have not received a response to any of the several communications I have sent to Moovly via their website. Cons: No customer service. I have sent several communications to Moovly via their website in the past month requesting to cancel my subscription and have not received a response. Well It has lots of benefits. Comments: Moovly's rather difficult to use in first place, getting familiar, specifically with syncing everything although once you get the hang of it, it isn't anything complicated. Pros: Available on desktop android and apple. Nice features and good training materials. Any one can use it. Cons: Pricey, cheaper/free software elsewhere. Pros: I was able to create a super pro video with soundtrack quickly and easily after watching a single tutorial. Everything I needed to do was intuitive or was easy to find support videos on ASAP. Cons: The pricing model related to dropping the meta information into the video unless you pay is a pain, but understandable given that they have to make money. Overall: My experience was absolutely seamless and honestly really enjoyable. It's just so easy to use. Pros: Pretty much the only thing you can say is that it holds some very basic video functions. Cons: It's awkward and clumsy to use and they promise far more features than they actually deliver. Overall: Highly overpriced, I have used free software that is easier to use and provides more features than this. Would not recommend at all.